What might be the effect on the October 2012 election? In polls till now, Lopez has run third behind top-runner Henry Capriles, his former political ally and governor of Miranda State, and behind Pablo Pérez, the governor of Zulia State. The Chávez administration has been actively shaping who may run for the opposition ever since President Chavez’ first electoral loss, in the December 2007 plebiscite. This decision is clearly a setback for this policy. The tribunal’s decision is clearly also a victory for the principles of democracy and rule-of’-law in Latin America generally. It seems that eight other Latin American states also allow administrative exclusions of candidates from running for office, or for being expelled from office while under official investigation or after having been charged with a crime. That is, they can be barred from participation before having been convicted in a court where they had a chance to defend themselves. His inhabilitatación undoubtedly has had an influence on Lopez´ranking in the pre-primary polls, and it is reasonable to expect that, if voters knew he was really able to run, he might poll significantly better. It should be made quite clear, however, that Venezuela doesn’t actually have any constitutional provision allowing administrative inhabilitación. The 1999 Bolivarian Constitution (aka, the Chavez constitution) clearly states that no citizen can be deprived of their civil rights without a judicial decision, a verdict, against them. However, the Venezuelan supreme court, with a preponderance of Chavista appointees, accepted the Comptroller-General’s argument that he could administratively impose this inhabilitación on Lopez – and on hundreds of other office holders and potential candidates – because he was not taking away “all of their rights,” but merely “some of their rights.” Specifically he was “only” taking away their right to run for office. This argument was judged by various judicial scholars to be faulty given the wording of the 1999 constitution. Nevertheless, the TSJ accepted this logic, and decided against Lopez. So, Lopez took the route of seeking protection under the Convention on Human Rights of the Americas. Unlike at the TSJ, the Inter-American Human Rights Court went unanimously in his favor. So, it is not at all clear that the Venezuelan TSJ will permit López to run for president. But, there are two sides to this. On the one hand, the comments made by President Chavez make it seem he expects the TSJ to block a Lopez candidacy. Moreover, even if the Human Rights court’s decision is implemented by the TSJ, there is a possibility that Chavez will insist that Lopez be charged with a different crime. This would likely be for his activities at the Cuban embassy during the days of the failed coup attempt against Chávez in 2002. It is clear that angry protestors went to the Cuban embassy and apparently violated its premises. I do not know clearly what transpired and in particular what if any was López’ role. In any case, in Chavista circles it is claimed that there is evidence available for putting charges against López and others for those events. This possibility was previously often mentioned in 2008, before Lopez was, instead, barred from running for “corruption”. On the other hand, boding in favor of President Chavez accepting the human rights court’s decision, there has seemed to be a tendency lately of President Chavez softening his attacks on both the opposition and his own far-left opposition. This is said to be because of his concerns over his cancer, and his failure to have prepared for a time when he might not be available as ¨the face of the revolution¨ in the popular areas, and, so, wants to tone things down and prepare for a calm transition to some appointed successor, if possible. 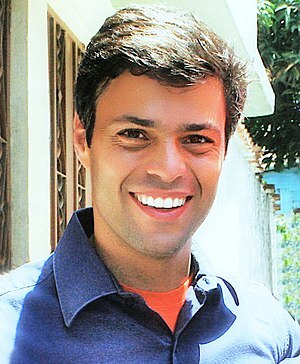 For example, a Chavista leader, a rather shady-character (in the opinion of much of Chavismo as well as others), representing himself as an official representative of President Chavez’ political party, the PSUV, formally denounced Henry Capriles, forcing charges to be brought against him in July this year. The accusation was, as is usual in other cases, of “corruption” in office. As a result, the prosecutor quickly presented the case to the appropriate judges who made a preliminary finding of, more or less, what we would call in the US, “probable cause” and the wheels then started to turn to bar him from running for president in 2012. However, after a couple weeks, the Chávez administration told the court that, in fact, the person who had made the denouncement of Capriles had misrepresented himself as a leader of the PSUV, a position he no longer held. And, so, this (somehow!) invalidated the charges, and the wheels turning towards disqualifying Capriles where halted. So, as I said above, we shall see what happens with López. There is some indication in each direction. On a more personal note: I was in Venezuela all year before the November 2008 regional elections. It was in the summer that López and dozens of other politicians were administratively barred from running for office. Overwhelmingly they were from opposition parties, but some Chavistas who had run afoul of the president were disqualified as well. I must say, to be living in a democratic country where the government suddenly bars hundreds of candidates from running for office (and simultaneously implements a whole raft of other anti-democratic electoral measures) just before a major election, has a deeply troubling impact on one’s psyche and democratic sensibilities. One could see a nodal point passed in those days for the Chávez presidency and for the Bolivarian movement. Chavez’ had recently experienced his first and rather stunning electoral defeat – his narrow loss in the constitutional-ammendment plebiscite of December 2007. For the first time he was clearly struck with a fear of significant electoral losses in the upcoming November 2008 regional contests. It was then that he had a clear choice to make as to the future of his movement and his presidency. Earlier in his career he had reached a similar nodal point. By 1994, after being released from prison for his 1992 failed coup attempt, he had decided to remake his political personality. He abandoned the path he had followed for at least ten years during which he had been consumed with the underground plotting to take power forcibly in a military coup. On leaving jail, the situation had changed in the country, a political crisis was deepening and a broad section of all classes were becoming ready for a definitive change of direction. It was in this situation that he committed himself and his Bolivarian movement to a new methodology, to revolutionary transformation not through violent means, but through electoral means. And, indeed, he brought his revolution to power and persevered against all challenges for the next nine years by winning one popular election after another. Of course, many in the opposition challenged the validity of these elections; but, nevertheless, it has been clear that, up to at least December 2007 that Chávez enjoyed a broad electoral base among the popular sectors of the country, and significant support elsewhere as well, such as gave him significantly more electoral support than the opposition forces combined enjoyed. And, there was a legitimacy in this electoral path as versus his previous violent path, one which was hard for opponents to shake. This ability to win at the ballot box, with the support of the poor as his electoral base, had become his signature. But, then, suddenly, after his December 2007 plebiscite loss, and in the runup to November 2008, he had to decide whether to persist in reliance and respect for the popular, democratic will at the ballot box, or to steer Bolivarian Venezuela into more controlled and restricted forms of electoral democracy. Clearly, with the mass inhabilitaciones of hundreds of candidates, with the self-serving TSj decisions upholding them, with corruption charges made against Rosales as they were, and with a plethora of new measures he then enacted over a period of almost a full year after November 2008 to regulate future electoral processes in his favor, Hugo Chávez had indeed passed another nodal point. He had clearly decided to change the rules of democracy however mush is necessary to counterbalance the erosion of his electoral base. But, not more than necessary, as this would quickly undermine his built-up reserve of good will abroad as a popular democratic figure. When push came to shove, he decided that maintaining Chavista power was more important than leaving a legacy of popular-democratic institutions. Since then, he has increasingly made recognition of his personal authority as opposed to the authority of the institution of a democratically elected presidency, the litmus test for the loyalty and promotion of leading members of the armed forces, of his cabinet, and within his Bolivarian movement generally. It is no wonder that some Chavistas, or, perhaps one should say old-style Chavistas, such as those at the Miranda Institute in Caracas, who tend not to the left, and others who tend to the center, now speak so often and so publicly about the “absence of collective leadership,” about the”tendency to hyperleaderismo” and about “Stalinist” tendencies. Whatever one might think of Chavismo of the past – good or ill – it is clear that this new Chavismo that manipulates democracy is NOT the Chavismo that inspired many of those who initially identified, and, to varying degrees, still identify with Chavismo. Among many of these people, I have recently heard many guardedly positive statements about the new opposition, and especially about the opposition-student movement, as opposed to what is seen as the older “oligarchic opposition”. President Chávez cannot easily now ignore the democratic sensibilities of honest persons within his own movement and simply push the TSJ to nullify the decision of the International Human Rights Court in favor of López. In fact there are a significant number of oppositional Chavistas who have themselves been declared inhabilitado for having expressed criticisms of hyperleaderismo and the like in the past. This entry was posted in Chavez, corruption, Henry Capriles, Hugo Chávez, Human Rights, Institutions and rule of law, Leopoldo López, Maracaibo, PDVSA, Uncategorized, Venezuela update, Venezuelan Democracy, Venezuelan elections, Zulia and tagged American Convention on Human Rights, Government, Henrique Capriles Radonski, Hugo Chávez, Human rights, Human Rights and Liberties, Inter-American Court of Human Rights, Leopoldo López, Manuel Rosales, Miranda (state), Petróleos de Venezuela, United States, Venezuela, Zulia. Bookmark the permalink. Congrats on your blog. One minor quibble: it’s the first time I hear about Leopoldo Lopez being linked to the events at the Cuban Embassy. If I remember correctly, Lopez wasn’t there, Capriles was, and his actions that day led to his imprisonment. But I might not be remembering correctly. Thanks much for your encouragement, Juan. I’m just getting where I feel I should ‘announce it’ to my e-mail lists. On the question of Lopez: i tried to be very careful, saying only that I remember the charge being levied by Chavista officialismo (I can look back through my old notes) and some friends saying there was some issue; but I never pursued the stories myself. as to whether Lopez was actually at the Cuban embassy that day. However, I can add this: last year I spoke to a reputable academic who had carried out extensive investigation of the events surrounding the temporary removal from power/coup against Chavez in 2003. When I said Lopez’ might win the case in the Corte del Derechos Humanos and then run for president, he immediately replied that the problem is that the government “has evidence” against him for activities during the coup (my understanding was that he was referring to actions at the Cuban embassy) with which they could charge him. Now I find this on line: http://www.state.gov/documents/organization/138012.pdf , which is a declassified US cable that talks of Lopez being at the Cuban embassy, based on press reports. Again. none of this indicates what officialistas might be able to legitimately charge him with, if anything. Thanks to Caracas Cronicles for referring you over to Global Barrel! I agree with you completely: it would be quite transparently politically motivated, and unfair to charge L. López with anything to do with the Cuban embassy affair taking place back in 2003 at this point, eight years later, and only after he is a presidential candidate. I am only trying to dutifully report the buzz I got from various sources in Caracas and from a very knowledgeable academic researcher as to what the intentions of officialismo had threatened in the somewhat recent past. However logical this tactic may have sounded to leading elements of officialismo previously, they may realize it would look pretty bad now. I found it interesting that Chavez et al interceded to withdraw a denunciation being made in the name of the PSUV this summer, that would have inhabilitated Capriles. it was simply too obviously political. I got sent to you by Caracas Chronicles, and am very glad to see the extremely high level of analysis here. Congratulations and don’t stop! On the Lopez/Embassy issue, the State Department cable simply says that “newspapers at the time reported” Lopez’s presence, which may mean something, or nothing. Depends on the newspaper. But surely the government could not possibly legitimately charge anyone with anything arising out of events in 2003! Especially if the people who get charged are the two leading Presidential candidates. Prosecutors in a democratic country are not allowed to sit on evidence of criminal activity for years, and pull it out when it is politically handy.